On the first day of Christmas PDR gave to me... some cheerful and charming holiday paper goods from Jenny and Marcy of befrank! Jenny Yip and Marcy Zuczek are the extraordinarily talented designers responsible for befrank, based out of Philadelphia, PA. They carefully craft exceptionally lovely and modern holiday cards, garlands, gift tags, lists, and more using a variety of unique colors and materials. Their attention to detail, love for vintage charm, and remarkable sense of style really sets befrank apart and we are thrilled to feature them on our blog for our 1st Day of Christmas! Jen had the pleasure of meeting with Jenny and Marcy at the Crafty Balboa fair last weekend and these generous gals were happy to share some of their favorites from their collection with us. Today's winner will receive one pack of holiday cards, one adorable gift tag, and handmade, paper notebooks with a beautiful lace print! This cute gift tag will make the perfect finishing touch to any holiday gift. 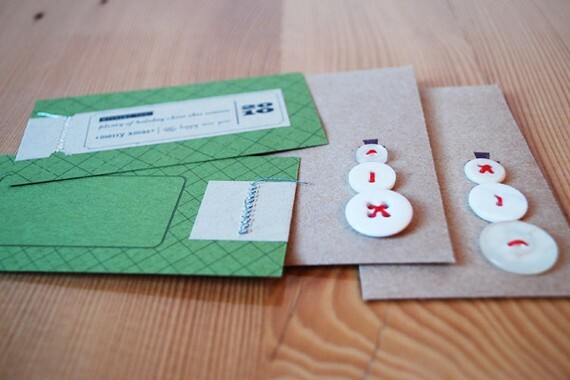 This cards is hand made, carefully stitched, and sure to bring some holiday cheer to your gift. The best part? 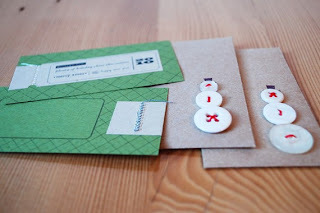 It fit into tiny envelopes that is adorned by a one of a kind button snowman made out of both new and vintage buttons and colorful red thread. This set of holiday cards is extremely unique and was one of befrank's items that first caught our eye. 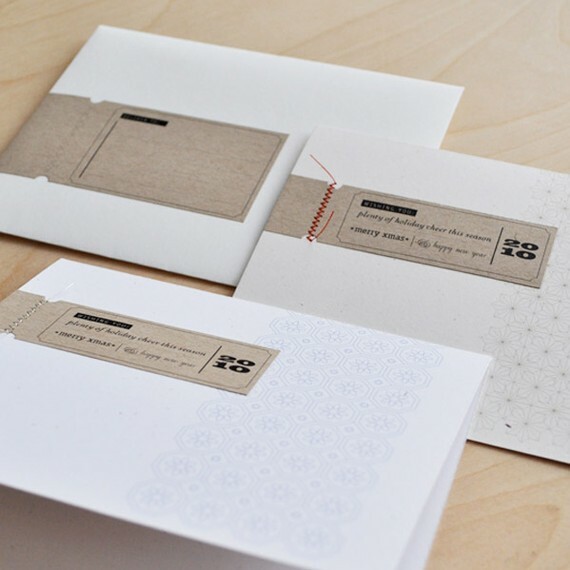 Wish your friends and family a merry xmas and happy new year with these neutral colored cards that feature an original wintery design and modern, funky, card stock tags that are stitched for extra sparkle. What a nice surprise these notebooks were! We had no idea that these would be included in the giveaway and we are so excited to have a set to give away to you. These two notebooks are handmade and printed with a lacey pattern and sweet bird graphic and have blank pages for all your notes and doodles. Much thanks to Jenny and Marcy of befrank for their generous gift donation. Be sure to check out their Etsy shop and keep an eye out for more unique items from these lovely ladies. Check back tonight when we announce the winner to see if you will be the lucky recipient of these great items. Also, be sure to check back later for a sneak peak of giveaways yet to come!